Lock in a great price for Sealife Family Resort Hotel – rated 8.7 by recent guests! Right next to the beach. Great hotels nearby. Travel agents are available at the hotel to plan your daily tours. Wonderful breakfast. it really worth the price , it was clean. the location of the hotel was in a good district it was quiet and beautiful. Wonderful hotel. Rooms very nice and clean , comfortable. The food was amazing and many choices. All at the front desk staff are excellent. The lady at the front desk, Lesya Buletsa was very helpful with giving info and advice. We plan on coming back to Sea Life Resort. We admired everything, room size is excellent and comfortable, seaside view is fantastic looking direct to amazing view, and staff were so friendly, great value for money. My parents stayed there in February. They were extremely happy with the staffs and the food choice. Ms. Lesya Buletsa helped them so much they want to thank her. Everything is awesome the food was very delicious, the room was so clean , the location is perfect near the sea only one minute, the staff was very helpful they called us before we come and helping to find the taxi to hotel and we would like to thank the beautiful blonde lady who is sitting on the front of the reception the assistant manager of relationship she is very kind and helps us all the days every thing we need we asking her and she always have answers and solve and her manger Mr.Khoran he is so kind and helpful, the staff on the reception is very helpful and kind , the person who is mange the tour in the hotel he is so kindly and very nice man he also speak alot of language really we are so glad to find this hotel and we enjoyed our stay, thanks all staff on sealife family resort hotel. We spent 4 nights at the hotel, the service was excellent, the staff were very kind and friendly specially the receptionists, the ladies in blue :), the drivers and the dancing teacher :). For the price we paid we got good rooms and all meals were included, the food was excellent, many varieties provided every day. Also night activities were organized by the hotel, dancing and drawing lessons for kids, musical shows and others. We also requested an extension for the check out timing and the hotel was very cooperative and flexible. The hotel was amazing. We would like to return to the city of Antalya and stay a few more nights at Sealife Resort. Sealife Family Resort Hotel This rating is a reflection of how the property compares to the industry standard when it comes to price, facilities and services available. It's based on a self-evaluation by the property. Use this rating to help choose your stay! One of our top picks in Antalya.Directly facing blue-flagged Konyaalti Beach, Sealife is an extensive resort with facilities and activities for the whole family. It features pools with slides, a spa with body treatments, diving and snorkeling equipment. 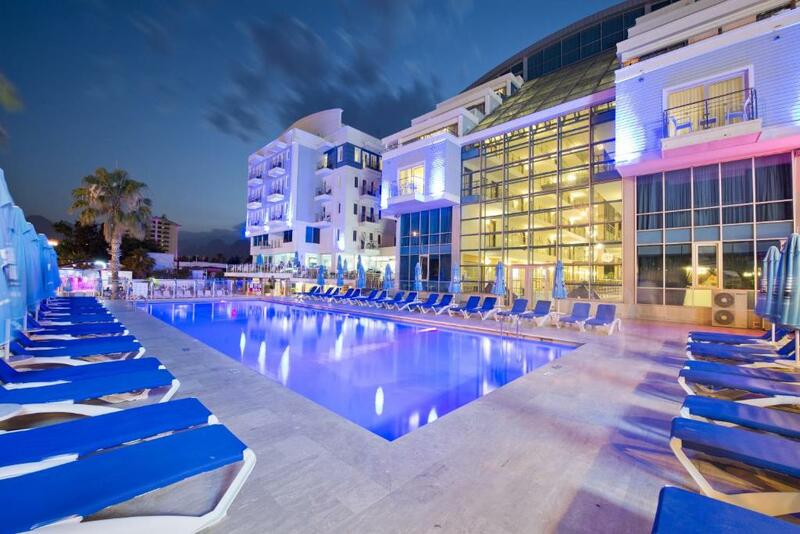 Air-conditioned rooms at Sealife Family Resort Hotel all open out onto a private balconies, most with Mediterranean sea views. Each is decorated with soft hues and contemporary furnishings. Modern appliances include satellite TV sets. Guests can choose among different restaurants, serving Ottoman and Fish specialties. There are also a handful of bars , an in house disco club and a bistro bar. An underpass allows easy access to the beach. A team of professionals runs the kids club in a dedicated area and the hotel’s grounds also provide tennis courts, a sauna and a traditional Turkish bath. Antalya Old Town is 6.2 mi from Sealife Family and Antalya Airport is a 30-minute drive away. 20 feet Migros Shopping Mall and an aquarium are located within 1.9 mi. MarkAntalya Mall is 5.6 mi from Sealife Family Resort Hotel. Free private parking is available and an airport shuttle service can be requested. When would you like to stay at Sealife Family Resort Hotel? Decorated in a modern way, this air-conditioned room has a seating area, TV, safety deposit box and a balcony with side sea views. This air-conditioned room has a seating area, safety deposit box and a balcony with side sea views. It has a bedroom and a living room. Modernly decorated, this air-conditioned room has a seating area, TV, safety deposit box and a balcony with side sea views. This air-conditioned room has a sitting area and a safe. Modernly decorated, this air-conditioned suite offers a spa bath, seating area, TV, balcony and sea views. This single room features a satellite TV, mini-bar and air conditioning. Offering views of the Mediterranean Sea, this suite comes with air conditioning, mini-bar and a flat-screen TV. House Rules Sealife Family Resort Hotel takes special requests – add in the next step! Sealife Family Resort Hotel accepts these cards and reserves the right to temporarily hold an amount prior to arrival. Babysitting/child services can be arranged on request at an additional fee. Please note that the parking lot is available with a certain capacity. Maybe the house keeping and replenish the toiletries ie cotton buds more. They didn't do that since we were there for about 5 days. The hotel was great especially being All Inclusive they had drinks time which was included and my boys thoroughly e enjoyed it. Getting a taxi outside the hotel was piece of cake it was literally outside the door step so you don't need to go far. Ironing facilities in your own room. We paid for ironing but my husband's shirt was teared near the button on the sleeve. Staff didn't seem to be very friendly. Were asking for room key/badge every now and then. Smaller rooms and got a room with very less visibility of beach, though I had booked sea view room. Few little facilities were missing from the picture of a 5*hotel, but we cannot complain of anything because we had a great time at this hotel. Location (next to Konyaalti beach), excellent food, staff was helpful and smiling, indoor pool, playground for kids, indoor activities for kids and adults, the view from the room, the little balcony. The staff worked like robots, there were no eye contact or a smile, they seemed to be oblivious that you were there, it was very unwelcoming. Great hotel with good facilities and great staff! Lasiya was really friendly and helpful!